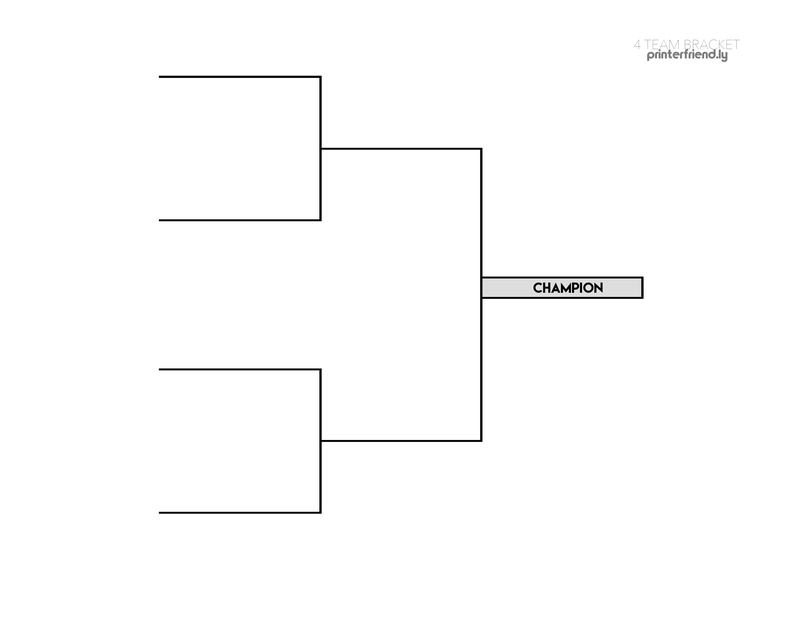 Do you have a small four team tournament coming up and need a blank bracket that’s also printable? Don’t move – you’re in the right place. Whether organizing the 4-team, single elimination bracket, playing in the tourney, or just here to clap your hands and support, a seeded bracket on paper is needed to track the field. What is a 4-Team Bracket? Tournament brackets vary in size based on the amount of teams participating. A 4 team bracket is simple as there’s the right amount of teams and just two rounds of action to determine the champion. Two pairs of teams play off to advance into the championship round. Take a look at the bracket sample to get a visual of what we’re talking about. You’ll see how the tournament will progress from the first round to the championship. From a management perspective, it’s going to be cake. Download our Excel version of the 4 team blank tournament bracket in XLSX or this 4 Team Printable Tournament Bracket in PDF format.